STEM or STEAM activities are great ways for kids to learn hands-on science, technology, engineering or maths and sometimes with an art twist as well. 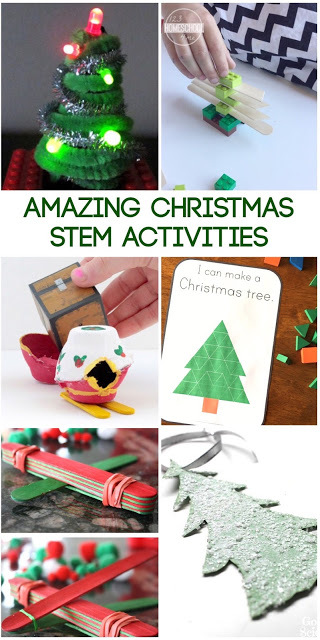 Here are Amazing Christmas STEM Activities, perfect for this time of the year! Use bits and pieces, pine cones, pine tree leaves, berries etc. associated with the holiday for a sink or float experiment. Building gingerbread houses are great to work on construction and engineering skills. Try it with healthy alternatives to make it more challenging. Little ones will enjoy making a Santa Chute with cardboard rolls, it is frugal fun too! Print this Little Elf senses book and explore senses through the eyes of Little Elf. These crystal candy cane and salt crystal tree will defined amaze your children. It will look great as tree ornaments too! Create fabulous art and explore science with this STEAM Christmas tree project. Build a LEGO Circuit tree that actually lights up, it will wow the kids! This pattern block challenge is fun to explore patterns and work on visual perception as well. Try this nature STEM project: frozen pine cones, so pretty! These LED Ornaments look really interesting to make, I bet your kids will enjoy it. 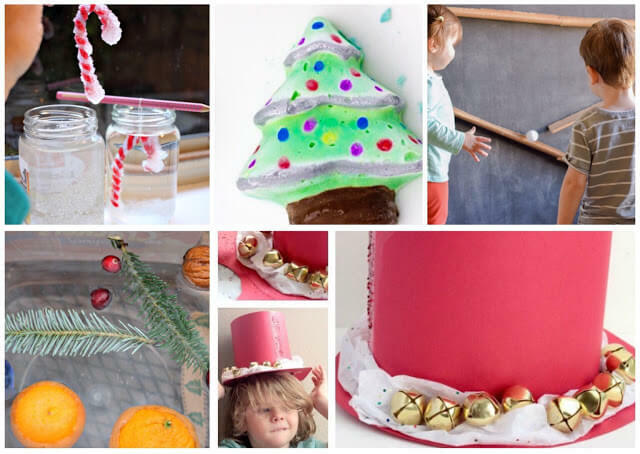 Little ones will love to construct a hat for Santa, adding an element of craft to it turns an ordinary construction project into fun! Another great idea that combines art and science is this design a Santa sleigh. Construct a Christmas tree: use playdough and craft sticks, things I bet you already have at home? This simple catapult, with a Christmassy twist, looks like fun too! Have you ever made Christmas magic milk with the kids? It is mesmerizing, try it out. Challenge your children with this balancing pom pom Christmas tree activity or make trees from Magna tiles and jingle bells. 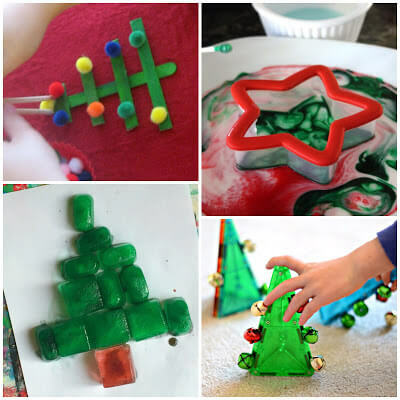 See how to melt ice Christmas tree and play around with color mixing or ice painting! Lastly, use LEGO and craft sticks to construct a Christmas tree, but be careful, it is tricky. So many fun Christmas STEM activities. Which one will your children want to try first?